From its Easterly end at Junction one Chiswick in West London to its Westerly counterpoint in Pont Abraham Junction forty nine in South Wales the one hundred and eighty nine mile long M4 provides a vital service to the UK. It links the capitals of Cardiff and London whilst taking in some of the most populated, employment heavy and industrialised towns in the country namely Slough, Swindon, Swansea, Newport and Reading. It also provides an interchange link to the M5 motorway for the South West and Midlands plus an access to the clockwise and anticlockwise routes of the M25. It is a vital route for Same Day Courier Manchester companies like All about freight. 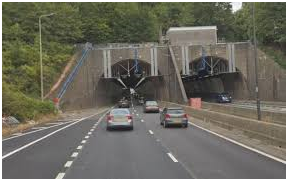 It is the only motorway to feature a twin bore tunnel, in the Brynglas Hill section at Newport in Wales, plus it has the huge Prince of Wales Bridge or the Second Severn Crossing spanning the River Severn. The road from Wales to London had been muted for a long time. Most of the country’s best quality coal was being produced by the South Wales fields and the transportation of this was not just reliant on rail. The road that was used, and which the M4 closely follows is the A4. This route goes through many towns and villages. For speed it was proposed that a new faster multilane road be built. The ground work was laid out in the nineteen thirties, but the cost and War years meant that construction did not start until 1956 when the Minister for Transport declared that there would be a major set of road improvements. The first stage was the Chiswick flyover, though this was not deemed a motorway originally. This was created to reduce the amount of traffic going through Chiswick and allowing this traffic to access the heart of the city or out into the countryside unimpeded. A south Wales without the M4 is now unthinkable. It enables the economy to operate. It has become entrenched in the physical and mental landscape. The time before it, a time of congestions and long journeys, a time not really that long ago, has been unremembered. Before the motorway, the chief route into England from south Wales was the A48. It ran from Gloucester to Carmarthen and went through the centres of Cardiff, Newport and Swansea. Building a motorway was not fast and it was not until 1966 that the 4.5 mile A48 (M) started. It slashed the journey time between Swansea and Cardiff by twenty minutes. For those who were not having to determine living beside the motorway, it was tough not to be influenced by how it ran over the town on 45-foot-high shining white solid pillars. The next section was the Maidenhead bypass in 1961 followed by the opening of junctions one to five in 1965. The next section to be built was the Newport junction eighteen, with the first Severn crossing that now makes up the M48. The A48 is the road that the M4 follows and replaces as the main route on the Welsh side. There was then, over the next ten years, a slow and steady continuation of the motorway along the Thames valley with the English section completing in 1971 with the opening of the Maidenhead to Swindon part. The original plan was for the motorway to terminate and switch back to the A48 dual carriageway just after Newport, but after pressure from the Welsh Assembly the Motorway extended into Carmarthenshire to take in Cardiff and Swansea plus Port Talbot. The road was finally finished in 1993 with the second crossing opening in 1996.